So much anticipation and days of swell checking means the forecast looks ideal. The fins, handplane, budgies and towel are packed into a bag. With a last check of the swell forecast to settle the nerves, the lights are switched off, and some rest is sought. The 0430 alarm goes off, but I’ve already been awake, so much excitement meant I couldn’t sleep. With a final check of the live wave and wind conditions the message is sent out to the crew. In need of sustenance for the day, a couple of bananas, a water bottle and some RedBull are grabbed from the kitchen for the drive. The roadtrip begins. From all corners of Sydney the boys drive to get to Pikers Hole before first light. For me, the dark morning trip to the place where I grew up is filled with anticipation and questions. 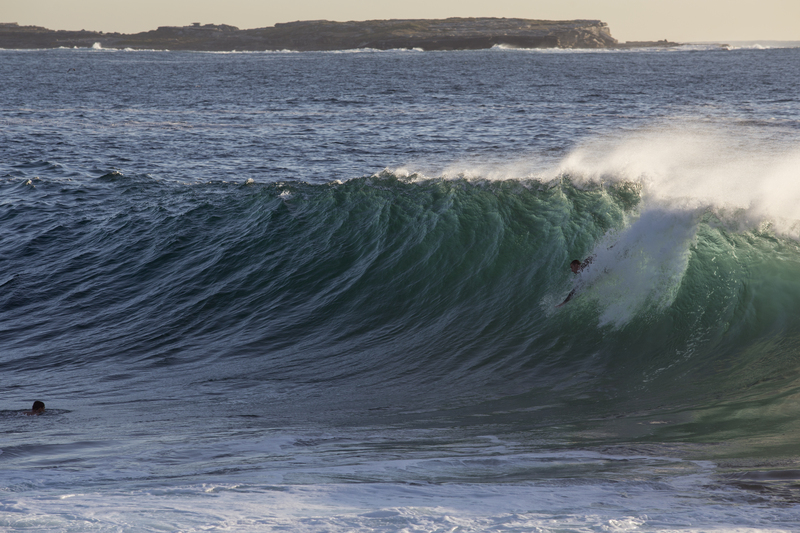 Is the swell big enough? Is it too big? Are the winds right? Is the tide right? Bodysurfing a place like this you need to have all weather conditions in your favor otherwise it is a recipe for a broken neck. As we make our way into the national park, with the deep throaty sounds of the swell crashing on the rocks in the distance, the cockatoos and kookaburras lighten the mood and swell the heart with their morning sings. Rounding the hill and into the car park, and there it is. Car by car the crew arrive hastily, Peter Sperling (@peter.sperling), Rikki Gibley (@wawhandplanes), Russel Pollard (@bornwithgills), Dan Carr (@captain_kookman), Vic Ivec (@whomp_dog) and Keeland Tracy (@keelandtracy). The initial signs are great, the thunderous sounds of waves crashing against the cliffs and the light offshore winds giving us a false sense of security about surface conditions. By now there is a touch of light in the sky and a bomb rolls through. 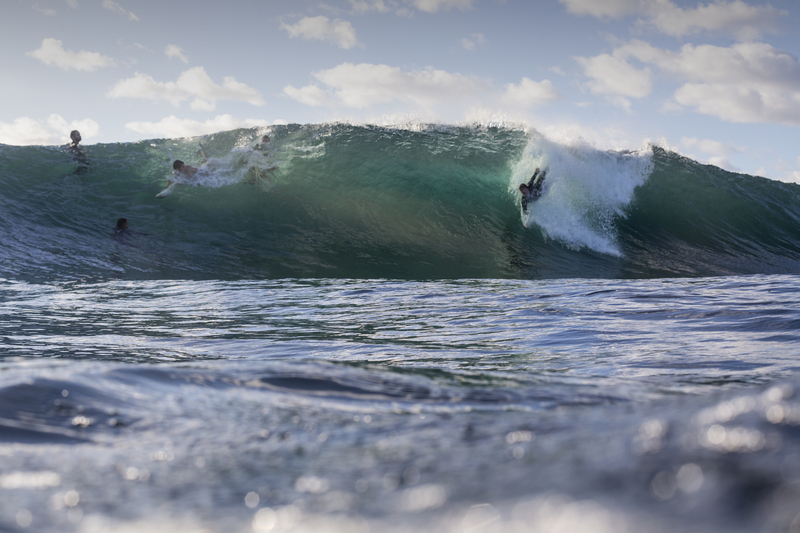 More than enough to excite the bodysurfer inside. Everyone suits up, a few stretches are performed and then a rock hop down to the entry. Timing is crucial. An error here can be an early and abrupt end to the morning session. The right wave is eyed off, followed by an entry as the water drains back off the cliff. The chill of the water immediately wakes you up. But the swim out to the take-off zone through the channel is enough to get the blood flowing. A bump on the horizon presents itself. As it hits the shallow rock ledge this bump triples in size, it is no longer a bump but a mountainous wall of water. You kick as hard as you can onto the face of the wave, a large initial drop that makes it feel like you’re flying, followed by a huge push along the face. The roaring sound of the wave crashing down over you, coupled with the view of the oncoming cliff and rock ledge definitely gets the adrenaline going, those chills from the jump in a distant memory. The wave starts throwing over you. Enjoy this moment while it lasts. If you’re in luck, the next 10-20 seconds will consist of you being washing machined into the shallow reef with a collection of cuts and bruises to take home with you.